Are you casting a love spell or a curse? Are you trying to create healing, or perhaps banishing? 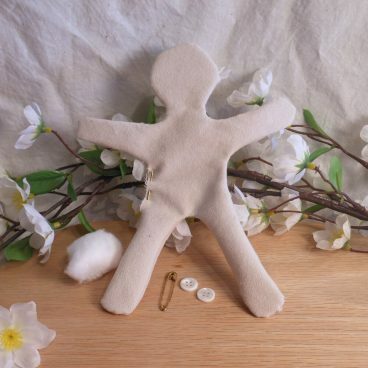 Whatever your purpose, these handcrafted poppets are a perfect base for any kind of sympathetic magic you may wish to cast. Only 4 left! Get yours now! Poppets are used for sympathetic magic practices in varying magical traditions. The dolls are stuffed with various items like herbs or charms, and used to represent oneself or another person during a spell or ritual. By default you will receive one doll that is sewn mostly shut. You will receive a golden colored safety pin which will be holding the side shut, as well as two white buttons for eyes. The doll can be customized in a variety of ways. Please read the options carefully and choose the what best suits your needs. Options vary from an empty doll through to a fully completed doll. (See the Additional Information tab for full descriptions) If you would like herbs added to your doll before shipment, please be sure to buy the proper packet from this listing to suit your needs. Hand stitched from cream-colored cotton fabric and cotton thread. Poppets will be created after you order; allow 5-7 business days for completion of each doll before shipment.